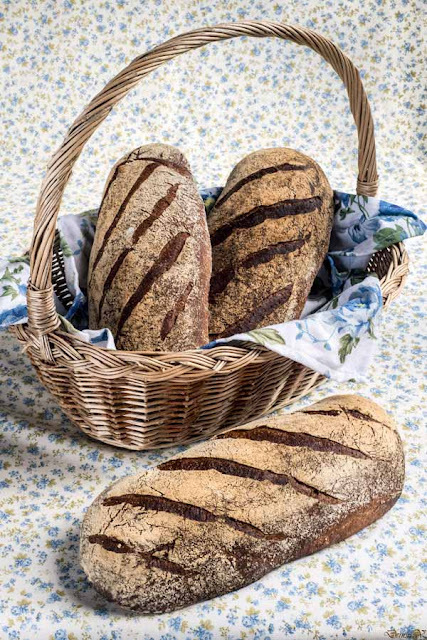 When I have started to make bread with a bread machine (at that time) I thought that the best bread should be the one with a lot of whole wheat inside. Although I was not wrong believing that this was one of the healthiest choice, in time I discovered other combinations of flours that could be impressive. This bread reminds me of those beginning times although qualitatively is superior. I have added a tablespoon of honey but the bread do not taste sweet. It helps instead for the bread to grow more. Ah, and I forgot again that adding sugars to the bread makes the bread becoming dark faster. Nevertheless, I have not burnt it. 20:30 (the day before) Make the preferment 12 hours before. Let it sit at 19ºC. 8:50 AM Mix all ingredients. As the preferment is not so liquid, cut it in pieces and put them in the mixer one by one. 9:00 AM Bulk fermentation 2h. You can do 1 stretch and fold after 1 hour. I was late for this and I did it after 1h30". 11:30 AM Divide and shape. I chose to make 3 oblong loaves. 11:45 AM Final fermentation 2h at 19ºC. 13:00 Start to preheat the oven. 13:45 Bake for 15" at 240ºC with steam and then another 30" at 200ºC. This recipe was inspired from Bread: A Baker's Book of Techniques and Recipes - Jeffrey Hamelman, page 117-118.